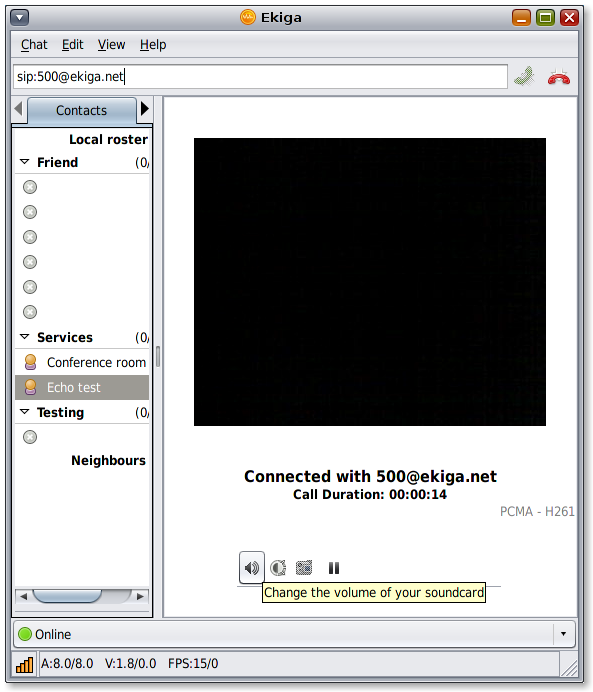 Ekiga is a free Voice over Internet Protocol (or VoIP) IP telephony and video conferencing application for Linux, Unix-like (e.g. BSD or OpenSolaris), and Windows operating systems. You can place audio and video calls from PC-to-PC or PC-to-phone. SMS-style messaging is also supported. It supports all major VoIP features like audio and video calling, call hold, call transfer, call forwarding, and instant messaging. It supports the best free video and audio codecs (with echo cancellation) for superior call quality. Ekiga has also been used in more exotic cases, such as sending fax over IP (in French). To find more information about Ekiga, please visit the Ekiga Home Page. http://ekiga.org. To report a bug or make a suggestion regarding the application or this manual, follow the directions on http://gnome.org. Ekiga is able to use modern Voice over IP protocols like SIP and H.323. The Session Initiation Protocol (SIP) is a protocol developed by the IETF MMUSIC Working Group and proposed standard for initiating, modifying, and terminating an interactive user session that involves multimedia elements such as video, voice, instant messaging, online games, and virtual reality. In November 2000, SIP was accepted as a 3GPP signaling protocol and permanent element of the IMS architecture. It is one of the leading signalling protocols for Voice over IP. H.323 was originally created to provide a mechanism for transporting multimedia applications over LANs, but it has rapidly evolved to address the growing needs of VoIP networks. One strength of H.323 was the relatively early availability of a set of standards, not only defining the basic call model, but also the supplementary services needed to address business communication expectations. H.323 was the first VoIP standard to adopt the IETF standard RTP to transport audio and video over IP networks. H.323 is based on the ISDN Q.931 protocol and is suited for interworking scenarios between IP and ISDN, respectively between IP and QSIG. A call model, similar to the ISDN call model, eases the introduction of IP Telephony into existing networks of ISDN based PBX systems. Ekiga is compatible with any software, device or router supporting SIP or H.323. It includes SwissVoice, CISCO, SNOM, Polycom, ... IP Phones, but also software like Windows Messenger, Netmeeting, SJPhone, Eyebeam, X-Lite, ... or also the Asterisk popular IPBX, as well as any other commercial or Open Source IPBX. Ekiga is not compatible with Skype and will never be as long as their protocol stays proprietary. We do not think using closed protocols for communications is a good thing. For more information about software compatibility see Ekiga Interoperability. You need a microphone audio input into your computer. A headset is recommended to prevent echo; however, a webcam with an internal microphone, or a separate microphone will also give good results. Note that a webcam is not mandatory. If you do not have it, you will still be able to see the other party. If you are behind a very restrictive network access, be sure to have correctly configured the firewall and the NAT router/gateway (see Ekiga behind a NAT router and routers and firewalls section in this manual for more information). it is developed in tandem with two libraries: ptlib and opal. External problems which might arise when using ekiga are bugs in libraries ekiga relies on, network itself (for ex. ekiga packets are changed by firewalls, or STUN issues), video device issues, interoperability (some SIP servers implement features partially or even contrary to the norm) etc. ptlib library contains audio/video devices and low-level functions, such as STUN. Ekiga is copyrighted by Damien Sandras (<dsandras@seconix.com>). Ekiga is free software (as in both free speech and free beer) and is licensed under the GNU General Public License (GPL) (either version 2 of the License, or (at your option) any later version) with the special exception that you have permission to link or otherwise combine this program with the programs OPAL, OpenH323 and PTLIB, and distribute the combination, without applying the requirements of the GNU GPL to the OPAL and PTLIB programs, as long as you do follow the requirements of the GNU GPL for all the rest of the software thus combined. You can find more information about GNU philosophy at http://www.gnu.org/philosophy. The creator of the project, Damien Sandras, initiated the project on December 25, 2000, as a master thesis at the Université Catholique de Louvain in Belgium. The logo/icon and the graphic art were drew by Andreas Kwiatkowski, see his website at http://www.kwiat.org. The mascot was drawn by Carlos Pardo. The mascot is named Lumi. You can visit Carlos' website at http://www.m4de.com. The code and the design of ekiga.org website was written by Fabian Deutsch. The old websites were done by Cédric Valcke. When starting Ekiga for the first time, the Configuration Assistant will launch automatically. The Conﬁguration Assistant is a step-by-step wizard that will guide you through all the steps involved in creating the basic conﬁguration you will need to use Ekiga. You should go through all of these steps properly, otherwise the assistant will re-appear (when it has not been completed) or Ekiga will not function correctly (if some of your answers have not been inaccurate). You may run the Configuration Assistant at any time from the Edit menu. Tip: All settings can be changed via the preferences window at anytime. Throughout the entire configuration process, navigation is available at the bottom of the window. You will be able to navigate through the questions using the Back, Forward and Cancel buttons. If you hit Cancel during the setup, Ekiga will not be affected by your changes, and all entered information will be discarded. This page welcomes you to the Configuration Assistant. There is nothing to change or edit here. Press the Forward button at the bottom of the window to start the configuration. The Personal Information window is where you enter your personal details needed to use Ekiga. You should provide both your first name and last name. This information will be displayed on your partner screen when you call him. 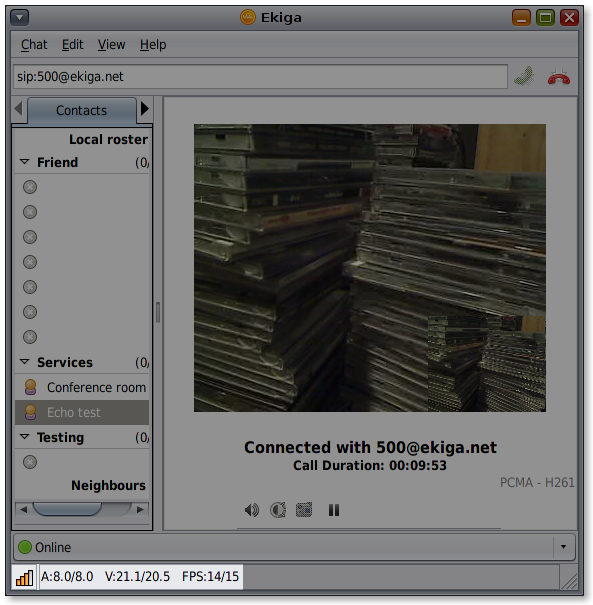 Ekiga.net is a free VoIP services platform provided to Ekiga users allowing PC-to-PC calling. If you want to call other users and to be callable yourself, you need a SIP address. You can get one from http://www.ekiga.net. Ekiga.net also offers additional services, like conference rooms and online white pages. Follow the link given in the dialog to register for an account (if you do not already have one), and fill in your username and password. Then press Forward to continue. Ekiga can be used with several Internet Telephony Service Providers. These providers will allow calls to real phones from your computer using Ekiga at competitive rates. There is no obligation for you to use a commercial provider, but if you need such service, we recommend using the default Ekiga provider. If you do not want to use a commercial provider, check the box in front of "I do not want to sign up for the ekiga.net free service", then press Forward to continue. If you want to create an account and use it to call your friends and family using regular phones at competitive rates, click the "Get an Ekiga Call Out account" link. Once the account has been created, you will receive a login and a password by e-mail. 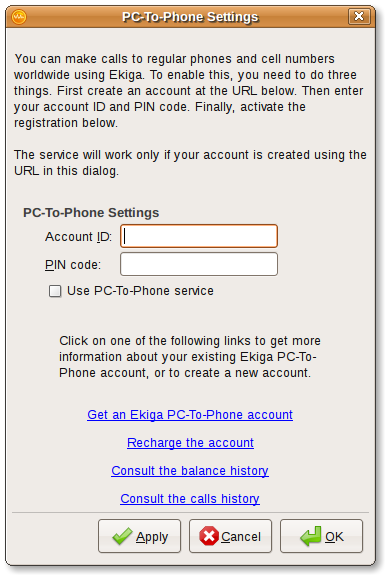 Enter these credentials in the dialog, and you'll be ready to call regular phones using Ekiga. Then press Forward to continue. See diamondcard section for more information. Ekiga supports several audio and video codecs. It includes codecs with excellent quality as well as codecs with medium to good quality. The higher the quality of a codec, the more bandwidth it requires. Moreover, video codecs can adapt their quality to the available bandwidth. This option is necessary in the initial conﬁguration of Ekiga so that it chooses the optimal codec suited to your network connection and so that it adjusts the video quality settings. If your connection type is not mentioned in the list you should select the one closest to your network connection and adjust Ekiga manually with the preferences window (codecs section) later on. This setting will help Ekiga select the optimal codecs to suit your available bandwidth. 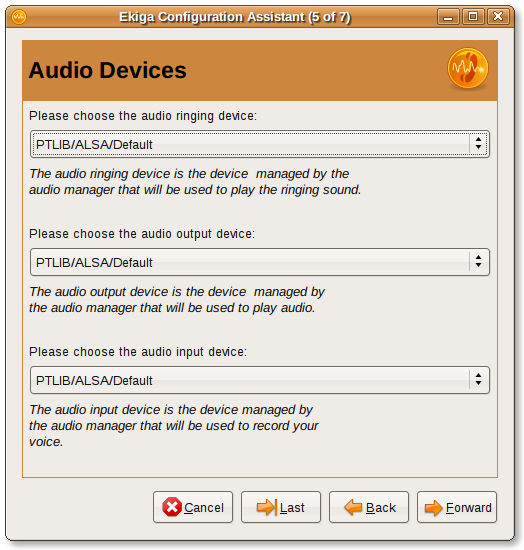 Audio device configuration is dependent on the operating system on which Ekiga is running, and different operating systems will configure audio devices in different ways. Ekiga will attempt to automatically detect audio hardware (e.g. a USB headset, or a webcam with a built-in mic) plugged into your computer. These audio devices will then be listed here, allowing you to select them for your calls. The audio ringing device (allowing you to hear a ringtone for incoming calls) is usually set to the internal sound card, under the name Default. The audio output device outputs the incoming sound stream during a call. You would typically select the device that your headphones or speakers are connected to. Default is a good choice for your internal sound card. The audio input device is where your microphone is connected to. Default is also a good choice for your internal sound card. These settings might be the same as the settings for the audio output device if you have only one soundcard, but it's also possible for the audio input to be set to another device, for example, the internal microphone on your webcam. Select a video plugin and video input device from the list. 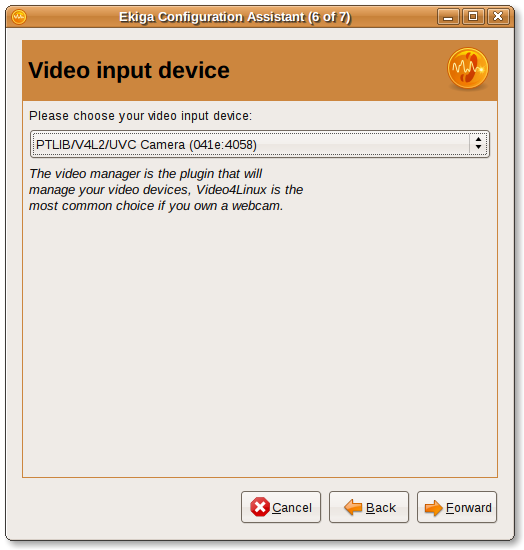 It can be Video4Linux2 to manage webcams, or any other choice depending on the operating system on which Ekiga is running. This step is optional and is relevant for users with video devices (e.g. webcams) only. If you do not have any video devices you may skip this page: Ekiga works fine for audio calls only. Configuration of Ekiga is now complete. The last window displays a summary of the settings you have chosen. Verify that your settings are correct; if something is incorrect, you may use the Back button in the lower right hand corner of the window to go to any page of the assistant to correct the mistake. If all is well, press the Apply button to save the configuration. The assistant will close, and the main window of Ekiga will now appear. Remember, all settings can be changed via the preferences window at anytime. It is generally recommended that you test your setup after having completed the Configuration Assistant. Click on the video camera icon (on upper left of Ekiga window). A new window will appear: if you see your face then the camera works well with Ekiga. Otherwise make sure that your camera is working by testing it with another program which uses camera, and check Troubleshooting page. If it still does not work, contact us. If you registered a SIP address with http://www.ekiga.net, you can call a dedicated echo test service by using the address sip:500@ekiga.net. You should hear a recorded message saying "You're about to enter an echo test. In this mode everything you say will be repeated back to you just as soon as is it received. The purpose of this test is to give you an audible sense of the latency between you and the machine that is running the echo test application. You may end the test by hanging up or pressing the pound key". By speaking into your mic, you should hear your voice repeated back to you after a short delay. If the test was successful, you can continue to the next page of this manual. If the test was unsuccessful (e.g. you cannot hear your voice repeated back), then you should restart the Configuration Assistant and test your configuration again until you have a setup that works for you. You might also be interested by free fun numbers. 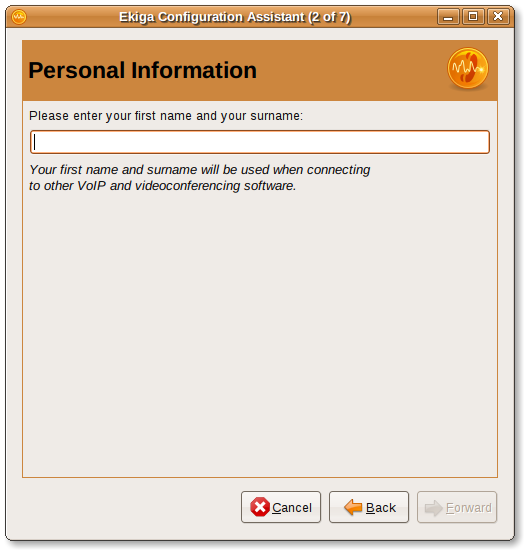 An account to a VoIP service provider is not mandatory for using Ekiga (you can use the IP address to call, or to use network neighbours, as shown later in the manual), but having at least one account will greatly enhance the Ekiga softphone experience. SIP addressing: If you want to call other users and to be callable yourself, you're best off with a SIP address, which is a human-readable address similar in appearance to an email address (e.g. sip:me@provider.net). Your personal SIP address is used by other users to call you. Similarly, you can use the SIP address of your friends and family members to call them. For example, sip:dsandras@ekiga.net is the protocol & address used to call the author of Ekiga. Searchable addressbook: most providers maintain a database registering their users, and may also allow searching through it. Ekiga is able search remote addressbooks if they use the LDAP technology. Conference calls: this service is in charge of collecting all audio (and possibly video) flux and mixing them before sending them back to the participants. The free PBX Asterisk can provide this feature too. Peering: this is an agreement between VoIP service providers which enables the users of one service to call users of another. This is usually implemented by dialing a special prefix number, followed by the number of the recipient (on the 'other' service). PC-to-Phone and Phone-to-PC calls: commercial providers may provide a bridge to PSTN/cellphone networks. The service routes the call to those networks, typically charging you for the operation. Voice mail: if you're not available, a caller may leave you a voice message. Ekiga tells you how many messages you have waiting. The free PBX Asterisk can provide this feature too. You can register with as many VoIP service providers as you want using Ekiga. 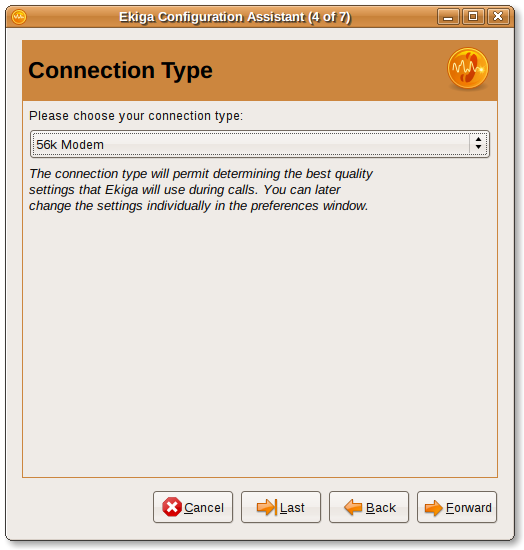 Ekiga.net is a free VoIP service for PC-to-PC communication. Ekiga.net gives you your own SIP address, a searchable addressbook, conference calls, and the ability to contact friends using other service providers with peering or ENUM. 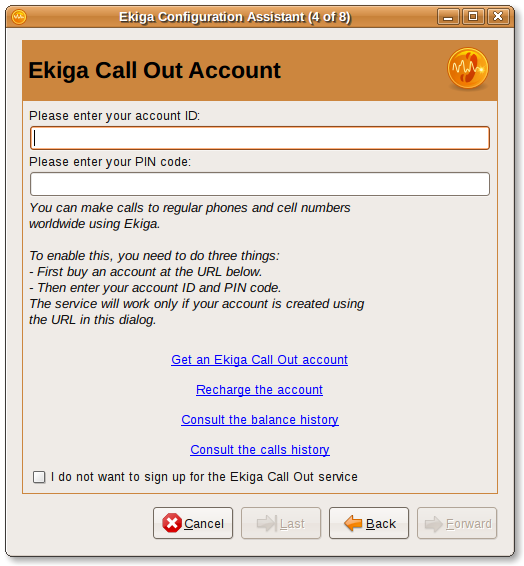 Ekiga Call Out is a commercial VoIP service for PC-to-Phone and Phone-to-PC communication. It also allows you to send SMS messages from PC-to-Phone. Callto addresses and H.323 addresses are formatted exactly the same except callto addresses also support ILS addressbook server lookups through callto addresses of the type: callto:ils_server/user_mail. For example, calling callto:ils.seconix.com/joe.user@somedomain.com will look for the user with the joe.user@somedomain.com email address on the ILS server ils.seconix.com and proceed to initiate a call. You can open the accounts window by selecting Edit -> Accounts. This will open the Accounts Window. The Accounts window will allow you to add and register with SIP, H.323 and other types of accounts or VoIP services. 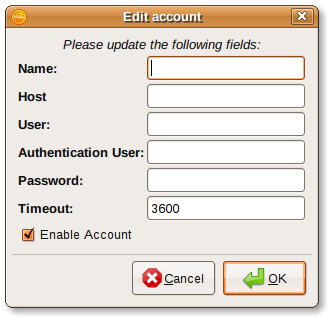 An account contains the user login and password details to register with to the account or VoIP service. These services can be an Internet Telephony service provider (like Ekiga.net), or an IPBX (like CISCO, Nortel, or Asterisk). Ekiga features automated registration with your service providers. If you choose to use the Ekiga.net or Ekiga Call Out service while in the Configuration Assistant, Ekiga will try to automatically register with them at startup. 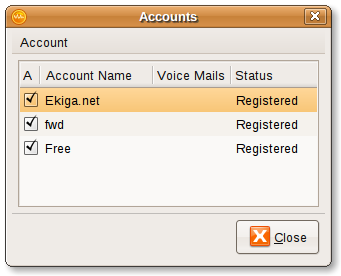 If later you want to add another VoIP service account, you'll have the option for Ekiga to automatically register with it while creating the account (tick the Enable Account box). At any time you can manually register and unregister with a VoIP service: in the Accounts Window (Edit -> Accounts), you can tick and untick the box in front of the account name to register and unregister the service respectively. Name: the account name goes here. This should be descriptive name, especially if you have accounts with several service providers. Registrar: the registrar with which you want to register. This is usually an IP address or a host name that will be given to you by your Internet Telephony Service Provider, or by your administrator if you are trying to register to a SIP IPBX. User: this is your account username. Authentication User: if the authentication user is different from the username you used above, enter it here. In this scenario, the User field will be used to control the outgoing identity for the account you are adding, while the Authentication User will be used during the authentication phase. Password: this is your account password. 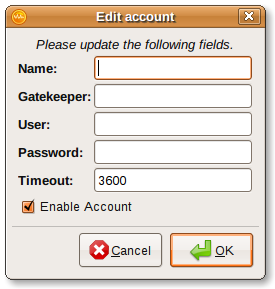 Timeout: The timeout after which the registration should be updated. 3600 is the default setting. Ekiga will do a best guess in determining the identity that will be used when calling out. Sometimes, you will need to force that identity. You can do this by specifying the identity in the User field. For example: dsandras@ekiga.net to force dsandras@ekiga.net to be used as outgoing identity for that account. The meaning of the parameters are similar to SIP account, see previous section. Usually, when calling someone, you type the SIP address which contains the registrar of one of your VoIP account, e.g. sip:dsandras@ekiga.net may refer to your account Ekiga.net as you can see at the end of this particular address. Ekiga will choose which account to use depending on the end of the SIP address if it is the same as one of the registrar you have in your account list to place the call. The default account is the one used when you type or dial a SIP address without the end of the SIP address (what is on the right of @), or the account used if you call a sip address which do not refer to any of your registrar in your account list. It is your own address at this default account which will appear on the SIP client of your friend as the source of the call. In the Accounts Window (Edit → Accounts), the bold font represents the Default Account. You can change the default account simply by highlighting the account you want, then clicking the "Default" button on the right side. If your default account is Ekiga.net, for example, you do not need to add "@ekiga.net" to the sip address or number you are calling. The contact list allows you to contact your friends easy. Note that the lines of the contacts added to the main contact list are automatically monitored. To add a contact to your Ekiga roster, click on Chat -> Add Contact. The Add to local roster window will appear, with fields to supply information for the contact's name and address. Contacts can also be added from a contextual menu by right-clicking in the roster, and selecting New contact. If you do not precise the host part, e.g. you add jim, not jim@ekiga.net, then in the roster right-clicking on the contact allows you to choose which account to use for that call or message sending. This is sometimes useful, as shown in the following. To remove a contact from your Ekiga roster, first select the contact as visible in the roster. Then click on Chat -> Contact -> Remove. The contact is removed from your roster immediately. Contacts can also be removed from a contextual menu by right-clicking on the relevant contact in the roster. 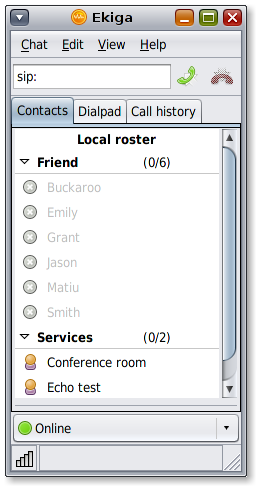 You can sort your contacts visible in the local roster into pre-defined groups, such as Friends or Work; this allows for example to make visible only one of the groups (e.g. Work when you are at work). You can also create custom group names to sort your contacts into, for example First Level Tech Support. To change the group a contact belongs to, first right-click on the contact as visible in the local roster, then click on Edit from the contextual menu that appears and tick the group you wish the contact to be sorted into. If you wish to add a custom group, enter your custom group name here, and click Add. Click OK to finish. Network neighbours is a special group in the roster, called Neighbours, which automatically discovers and shows all ekiga users from your LAN. It is updated each time a users connects or disconnets from your LAN. Neighbours group is visible, at the bottom of the roster, only if there is at least one ekiga user in your LAN. It is available if only ekiga has been built with support for it. This feature uses the zeroconf technology (called sometimes Bonjour or avahi or rendezvous). This feature assumes you have a local mDNSResponder daemon running on your computer, which is the case for current GNU/Linux machines. Windows version of ekiga does not support currently this technology, see bug #557040 (so your neighbour tab will not be shown). The Address Book is a feature which allows you to ﬁnd users to call and/or to save locally your list of persons that you call on a regular basis. It respectively loads the list of users from the LDAP directory and will store locally their addresses. To open the Address Book window, select Chat → Address Book. To your left there will be a list dialog showing the Servers you have added to the list as well as a list of local Address Books. The defaults are the Ekiga.net white pages, the personal address book from Novell Evolution (http://www.novell.com/products/evolution) and the call history. Ekiga is able to use several types of address books, allowing to search for remote contacts, and bookmark local contacts. The most common address book type is the LDAP directory where you can ﬁnd information about registered users. Ekiga is able to browse any LDAP directory and use a speciﬁc attribute as calling URL. For example, you could have an LDAP directory in your company, with a speciﬁc attribute containing the local extensions of all your colleagues. Ekiga is able to use such an LDAP directory. Simply select in Address Book → Add an LDAP Address Book, and fill the form. Ekiga is also able to detect other Ekiga users on the LAN using the Bonjour technology popularized by Apple (tm). That supposes you have a local mDNSResponder daemon running on your computer (which is the case for GNU/Linux). 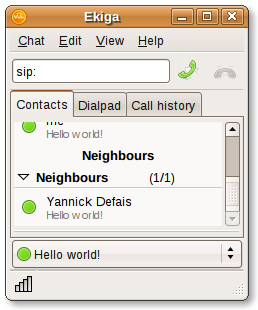 Finally, Ekiga is able to bookmark contacts in the local address book, shared with the Novell Evolution (http://www.novell.com/products/evolution) suite. To view address books, select Chat -> Address Book and the Address Book window should appear. 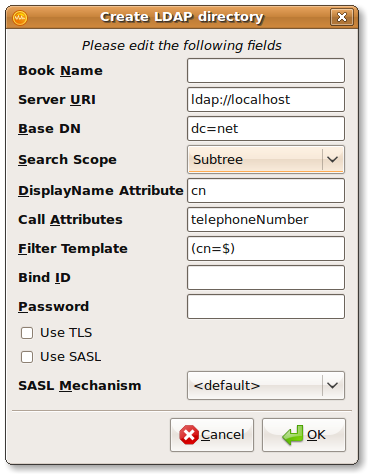 In the left-hand pane there will be a list of local address books, as well as any online (LDAP) address books. 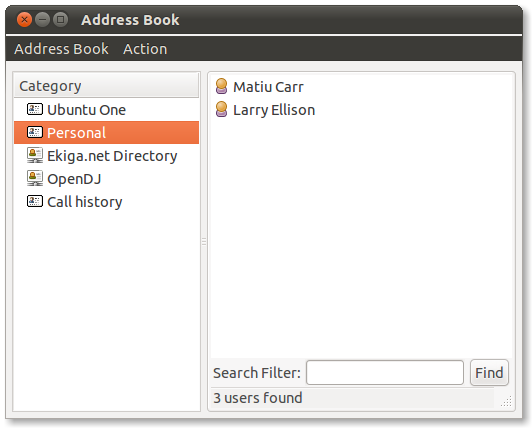 The default address books are the Ekiga.net online directory, and the Personal address book shared from Novell Evolution if you use the GNOME desktop, or, the Personal address book shared from KAddressBook if you use the KDE desktop. To search for a user in the local address book, simply click to highlight it in the left hand pane, then enter the user's name in the Search Filter field and click the Find button. You can place a call to a user by double-clicking on their name in the search results window. You can also place a cell phone call to users in the local address book, if the user information was originally entered using Novell Evolution. To add a contact to the Ekiga local address book, simply select the address book, then select Action -> New Contact. The New contact window will appear and you may now enter the user's name and VoIP address, as well as any other settings. Click OK to finish. If you are running Novell Evolution or KAddressBook, you'll notice the contact has been updated in each respective application's Personal address book as well. Note that you can only add contacts to local address books in Ekiga: adding contacts to LDAP address books from within Ekiga is not supported. To remove a contact from a local address book, highlight the contact, then select Action -> Remove. The contact can also be removed by right-clicking on the contact, then selecting Remove from the contextual menu that appears. Additionally, if you remove the contact from either the Novell Evolution or KDEAddressBook applications, then this will also remove the contact from Ekiga's local address book. Note that you can only remove contacts from local address books in Ekiga: removing contacts from LDAP address books from within Ekiga is not supported. Ekiga is able to connect to online address books, allowing you to search for contacts in a remote directory. The most common online address book type is the LDAP directory. Ekiga is able to search an LDAP directory and use a specific attribute as a calling address (i.e. VoIP URI). For example, you could connect to a an LDAP directory provided from within your own company, and use a specific attribute containing the local extensions of all your colleagues. You can use the Search Filter field to search for contact names and call addresses in an LDAP directory. A limited number of results corresponding to your search are returned. To connect to an LDAP directory, open the address book window, and click on Address Book -> Add an LDAP Address Book. Enter the book name and the various parameters and select ’OK’ and the new address book should now appear in the address books list. for the filter template, a "$" is replaced by the search string, whatever was entered in the search dialog box. No other substitutions are performed. for custom attributes, the value must be either a URL or a simple value. If it's a simple value, a "sip:" URL prefix will be tacked on before displaying it. If you do not know what parameters to use for a remote LDAP address book, please ask them to your administrator. You can remove an LDAP address books by first highlighting the address book in the left-hand pane of the address book window, then clicking Action -> Remove addressbook. You can also right-click on the address book you wish to remove, and select Remove addressbook from the contextual menu that appears. 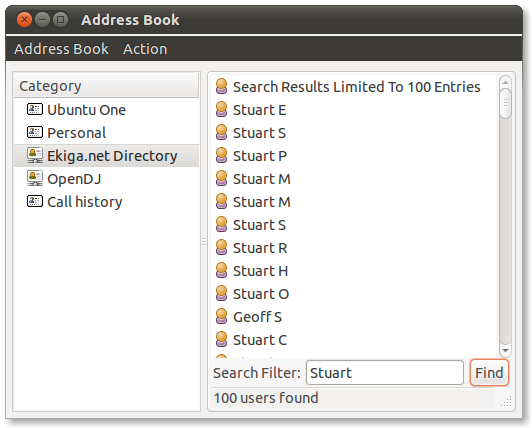 The Ekiga.net address book is an LDAP directory pre-configured in Ekiga, allowing convenient searches for other Ekiga.net users. You can use the Search Filter field to search for contact names and call addresses, and a limited number of results corresponding to your search are returned. 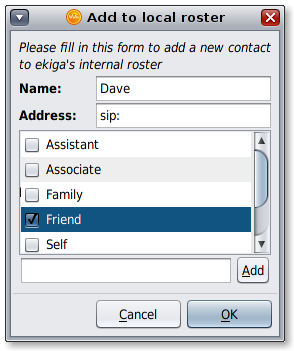 You can easily add a contact to your local roster from the Ekiga.net directory, or any other LDAP address book. Simply highlight the user, and click on Action -> Add to local roster. You can also right-click on the contact, and select Add to local roster from the contextual menu that appears. You can set a status message in Ekiga that advertises your presence to your contacts. Ekiga features three preset status messages, and within each one of these presets, custom status messages can be created. Simply click on the drop-down status message list to select a preset status. Note that you may be called in any of these statuses; they are used simply to inform the other users about your wish. To define a custom message, click on the drop-down status message list in the main Ekiga window, and select "Custom message..." under the preset status message category you wish to use. In the pop-up window that appears, enter your custom message, and click OK to apply. To delete a custom message, click on the drop-down status message list in the main Ekiga window, select Clear, and select the custom message you wish to delete. Click Delete to apply. Ekiga supports different policies for incoming calls. It displays a notification in the systray or shows you the call window which allows you to decide whether you want to refuse or accept the request. If you manually open the call window, you can also accept a call using the pick up icon of the window. Ekiga supports several actions which can be performed when in a call. These actions enable you to control active sessions. If you want to call other users and to be callable, you usually need a SIP address. You can get a SIP address from http://www.ekiga.net as described above. The SIP address can be used by other users to call you. Similarly, you can use the SIP address of your friends and family to call them. You can for example use sip:dsandras@ekiga.net to call the author of Ekiga. You can use the online address book of Ekiga to find the SIP addresses of other Ekiga users. It is of course possible to call users who are using another provider than ekiga.net (see also Peering and Enum). You can actually call any user using SIP software or hardware, and registered to any public SIP provider. If you know the URI address of the party that you wish to call, you may enter that URI into the sip: input box at the top of the screen and press the Connect button; eg: sip:foo@ekiga.net and pressing the Connect button would call the user at that address. With the default setup, you can simply type sip:foo to call user foo@ekiga.net. Tip | Ekiga also supports H.323 and as such can call any H.323 software or hardware. Please refer to the section REPLACE_"Understanding VoIP addresses"_REPLACE to learn more about the various types of URIs that can be used to call remote H.323 and SIP users. Ekiga can be used with several Internet Telephony Service Providers. Those providers will allow calling real phones from your computer using Ekiga at interesting rates. We are recommending you to use the default Ekiga provider. The default provider is Diamondcard Worldwide Communication Service, which offers these rates. When signing up for a DiamondCard account, a small amount of the subscription is given back to the Ekiga project. If you want to create such an account and use it to call your friends and family using regular phones at interesting rates, go in the Tools menu, and select the "PC-To-Phone Account" menu item. 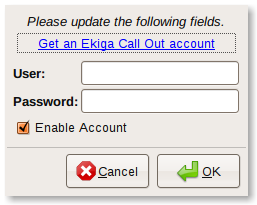 A dialog will appear allowing you to create an account using the "Get an Ekiga PC-to-Phone account". To dial a number, simply add "00" followed by the country code, and by your number. For example, sip:003210111111 to call number 10111111 in Belgium. If Ekiga.NET or the PC-To-Phone account are not your default account, you will have to enter the full URL to be able to dial, without the leading "00": sip:3210111111@eugw.ast.diamondcard.us. See List of PC to phone providers for a list of alternative providers. You can use several providers at the same time. Ekiga can be used to receive incoming calls from regular phones. To allow this, you can simply login to your PC-To-Phone account using the Tools menu as described above, and buy a phone number in the country of your choice. Ekiga will ring when people will call that phone number. You can actually use any H.323 or SIP ITSP provider, including your own PBX at work. However we recommend using the integrated provider. You can hold an active call by selecting Chat -> Hold Call. This effectively pauses video and audio transmission. To resume the call select Chat -> Retrieve Call. Video and audio transmission will then resume. To mute audio during an active call, select Chat -> Suspend Audio. Audio will cease to be sent, but video transmission will continue. To unmute audio, select Chat -> Resume Audio. To mute video during an active call, select Chat -> Suspend Video. Video will cease to be sent, but audio transmission will continue. To unmute video, select Chat -> Resume Video. Starting with version 4.0.0, ekiga can auto-answer calls. When the "Automatically answer incoming calls" ckeck box in Preferences->General->CallOptions is enabled, incoming calls are immediately automatically answered. Note that for security reasons Ekiga does not (yet) support call auto-answering when a specific SIP tag appears in the incoming packet. to automatically forward calls when you do not answer after a configurable amount of time, or when you are busy. 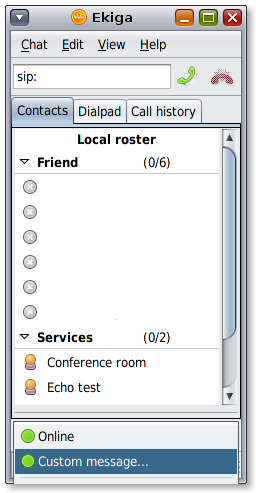 Call Forwarding can be configured through the preferences window. Notice that you need to specify an URI where to forward calls in the preferences to be able to activate that option. Open the preferences window by choosing Edit -> Preferences in the main window and select Call Options on the left. You will now see the appropriate section. It contains three checkboxes for the three cases described above. The IP address/hostname of the host the calls shall be forwarded to can be configured separate in SIP Settings for SIP and accordingly in H323 Settings for H323. During a call, you can transfer the remote user to another SIP/H.323/CALLTO URI by using the appropriate menu entry in the Call menu or by double-clicking on an user in your contact list, or in the call history. This is similar to a secretary who receives a call, and after some discussion transfers the call to the right person in the organisation. Note that Ekiga does not support to ask permission of the target address to accept the call transfer. The Call history window stores information (date, duration, URI, Remote user) about all outgoing and incoming calls. They are divided into three groups "Received calls", "Placed calls" and "Unanswered calls". Tip | REPLACE_Right click_REPLACE on a row in the Calls History will NEW_allow to_NEW call back the selected user, or transfer any active call to that userNEW_, or add the selected contact to the roster_NEW. CANDIDATEFORSUPPRESSION_Notice that you can also drag and drop entries from the Calls History into the Address Book to store contact information. This information can be accessed by opening REPLACE_View_REPLACE->Calls History and by switching between the three tabs. Double-clicking on a row in the Calls History will call back the selected user or transfer any active call to that user. 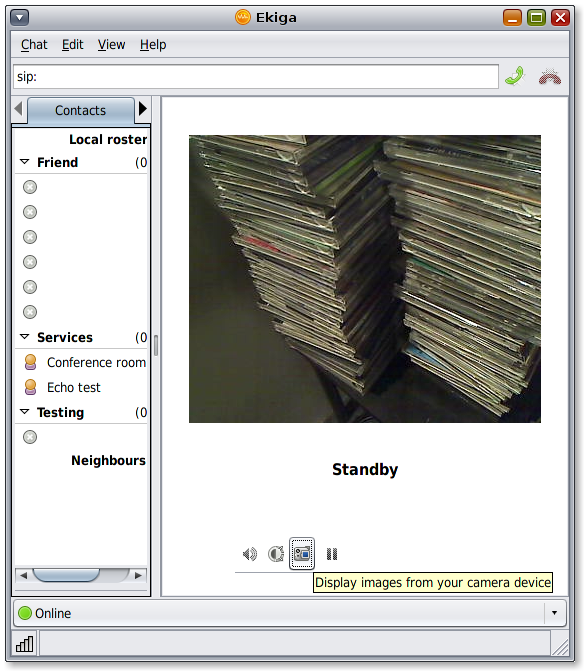 The status bar (visible at the bottom of the main Ekiga window) shows information about audio and video bandwidth, and the video FPS (frames per second) achieved during an active call. Lost packets: The percentage of lost packets, i.e. packets from the remote user that you did not receive. Too high packet loss during reception can result in voice and/or video distortion, and is usually caused by a bad network provider or by settings requiring excessive bandwidth. Late packets: The percentage of late packets, i.e. packets from the remote user that you received but too late to be processed. Out of order packets: An out of order packet is a packet that it is sent before another packet, but it arrives after the other packet. The percentage shown is the number of out of order audio and video packets divided by the total number of audio and video packets. Jitter buffer: The Jitter buffer is the buffer where received sound packets are accumulated. When the buffer is full, then the sound is played. If your network is of insufficient quality, then you need a big jitter buffer - which results in a larger delay before sound is played back. Resolution: The resolution is the video window size in pixels (X by Y) of the transmitted video (TX), and the received video (RX). Ekiga allows you to send instant messages to your SIP contacts. Chat messages are not stored on any server, so in order for chat to work your partner must be connected when chatting. To compose a text message to a user, first highlight the user as visible in your contacts roster, then on the Ekiga menu bar goto Chat -> Contact -> Message. 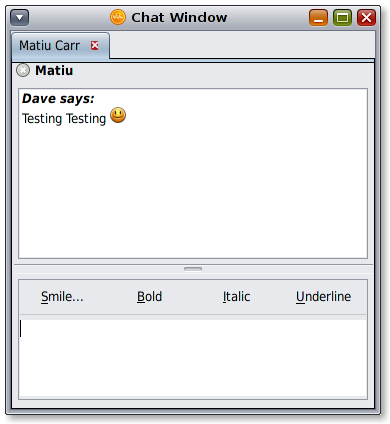 The chat window will appear and allow you to perform a text conversation with the selected remote user. To send the message simply type Return. To insert a new line inside the message, type Shift-Return. You can also open the chat window from a contextual menu by right-clicking on the user in your roster, and selecting Message. You can also exchange text messages with H.323 Ekiga users, but only while being in a call. To do this, simply click on the new tab icon, and a new tab will automatically be created allowing a conversation with the user you are on a call with. To be checked: H.323 text chat however only works from Ekiga to Ekiga. Ekiga features full emoticon functionality, accessible from within an active chat window. 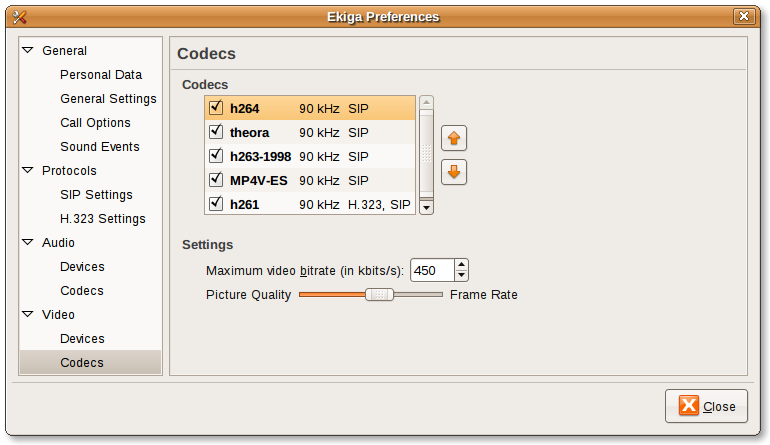 Ekiga supports several audio and video codecs. It includes codecs with excellent quality, as well as codecs with medium to good quality. The higher the quality of a codec, the more bandwidth or CPU power it requires. The first time the Configuration Assistant is run during the initial setup of Ekiga, an optimal selection of codecs is automatically made based on your network connection. When the Configuration Assistant is run during the initial setup of Ekiga, all audio input and output devices attached to the system are detected and displayed in a drop-down list - you simply select the desired audio input and output device to use. If you wish to change the audio input or output device afterwards, this may be set in the Ekiga preferences window under Edit -> Preferences -> Audio -> Devices. See OSS4 appendix for using OSS4 as audio device. For the best audio quality, we recommend the use of a microphone/headphone combination. 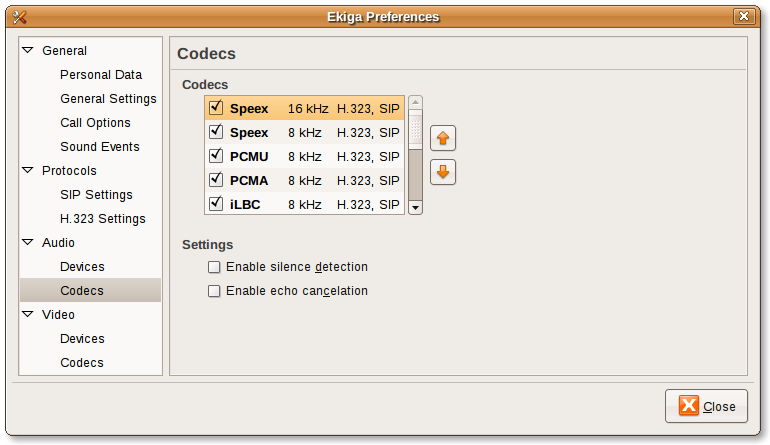 The audio codecs table in the Ekiga preferences window allows you to enable, disable, and reorder audio codecs. Each codec has strong and weak points. For example, the G.711 codec (also known as PCMU/PCMA) will give you very good voice quality, but it will also use the most bandwidth; the Speex codec on the other hand will give you average voice quality, but with very low bandwidth usage. Note that there are two versions of Speex, one with 16kHz and another one with 8kHz, the former is more accurate but consumes more network bandwidth. When you reorder codecs, you are reordering the local capabilities table. 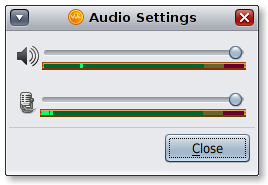 During a communication, only one audio codec is used, for both directions. The audio codec used is the first active codec on receiver which is active on sender. You can force the use of a specific codec by selecting it and disabling all other codecs, but this will result in failed calls if the remote user has not enabled that specific codec. The best approach is to put your preferred codecs at the top of the list, and to disable the codecs that you do not want to use for sending and receiving audio. You can the maximum delay to wait before playing the sound buffers that you have received using the jitter buffer adjustment. If there is too much packets loss, the delay required to have received all packets could be so important that it will exceed the jitter buffer. In such a case, the sound you are receiving will be of bad quality. A solution to that problem would be to increase the maximum limit of the jitter buffer to say one second, resulting in a big delay but an improved voice quality. The jitter buffer will adapt itself to the lowest delay allowing for optimum transmission. A bad voice quality in reception is not due to a too high jitter buffer value, but to bad internet connection quality. Echo cancellation will only work if you use the same sound device for in and out audio, e.g. echo cancellation won't work if you use the microphone on your webcam and the output sound from your soundcard (PCI). The reason is that the echo cancellation mechanism needs to sync the in and out sounds and this cannot be done properly using two different drivers. Remember that a camera is not mandatory to use Ekiga. Every camera supported by the Linux kernel and compatible with the Video4Linux/Video4Linux2 APIs (Philips webcams, Creative webcams, and many others...) can be used with Ekiga. 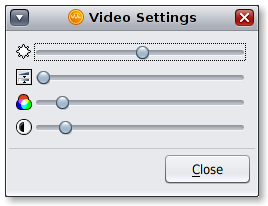 The supported video settings are found in appendix. When the Configuration Assistant is run during the initial setup of Ekiga, all video input devices attached to the system are detected and displayed in a drop-down list - you simply select the desired video input device to use. If you wish to change the video input device afterwards, this may be set in the Ekiga preferences window under Edit -> Preferences -> Video -> Devices. You can also adjust other settings for the selected video input device, such as the size of the transmitted video display, the regional video format, and the video source channel to use. Tip: The regional format does not apply to most USB cameras. Tip: If there is a problem with the selected video input device, a test picture will instead be sent. The video codecs table in the Ekiga preferences window allows you to enable, disable, and reorder video codecs. Each codec has strong and weak points. For example, h261 is an older codec available on the widest variety of video conferencing systems, but has average quality. h264 has very good video quality, but is not necessarily available on every platform. When you reorder codecs, you are reordering the local capabilities table. During a communication, only one video codec is used. The video codec used is the first active codec on receiver which is active on sender. You can force the use of a specific codec by selecting it and disabling all other codecs, but this will result in failed calls if the remote user hasn't enabled that specific codec. The best approach is to put your preferred codecs at the top of the list, and to disable the codecs that you don't want to use for sending and receiving video. Tip: Video codecs can adapt their quality to the available bandwidth. This setting is made when the Configuration Assistant is run during initial setup of Ekiga, so that an optimal quality codec is selected based on your network connection. You can test your webcam in two ways: by enabling a local feed of your webcam video ouput, and by making a test echo call. To view a live local video feed of your webcam, first enable the Ekiga Call Panel (View -> Show Call Panel), then press the camera icon. You should see the video output from your webcam displayed in the call panel window. To make a test video call, place a SIP call to the Ekiga echo test service (sip:500@ekiga.net). Once successfully connected to the echo test service, you should see a picture-in-picture view in the call panel window: the main picture displays video sent from the remote end, while the smaller picture is the local video feed from your webcam (i.e. the video being sent). You should observe a small delay between the two - this is normal. Tip: The echo test only accepts the h261 video codec for video calls. Ekiga uses a best-effort algorithm to maintain low bandwidth usage when transmitting video. You may if you like adjust video quality settings favouring a good frame rate, or, a good picture quality. Ekiga will dynamically adjust the video bandwidth and the number of transmitted images per second during a call, while trying to respect the requested video bandwidth. A best-effort algorithm means that it may be impossible for Ekiga to respect a bandwidth setting if it is set too low. However, if the video bandwidth allows transmission with a higher picture quality or a faster framerate than the set value, then Ekiga will dynamically adjust this so that the quality and the framerate are always the best possible. Choosing a higher framerate and a lower picture quality will have the same result in terms of video bandwidth as choosing higher picture quality with a lower framerate. It depends if you prefer using your bandwidth to transmit more lower quality images, or fewer better quality images. The outbound proxy is the SIP proxy that will relay your calls. The behavior of a SIP proxy is similar to the behavior of an HTTP proxy, ie some entity that issues the requests on your behalve and proxies the streams. The proxy is currently used by all accounts. See feature request 340251: outbound SIP proxy setting should be attached to accounts. 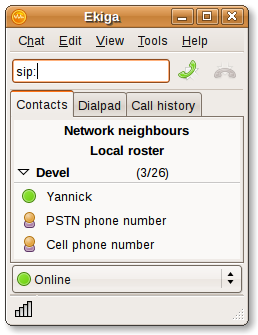 The URI to which SIP incoming calls should be forwarded if configured in the preferences. The URI to which H.323 incoming calls should be forwarded if configured in the preferences. Ekiga permits a fine control of the H.323 settings in the Advanced H.323 Settings section of the preferences. You can enable H.245 Tunneling, Early H.245 and Fast Start. H.245 Tunneling is the encapsulation of H.245 messages within H.225/Q.931 messages (H.245 Tunneling). If you have a firewall and enable H.245 Tunneling, there is one less TCP port that you need to allow for incoming connections. This enables H.245 early in the setup and permits to achieve faster call initiation. Fast Connect is a new method of call setup that bypasses some usual steps in order to make it faster. In addition to the speed improvement, Fast Connect allows the media channels to be operational before the CONNECT message is sent, which is a requirement for certain billing procedures. It was introduced in H.323 version 2. 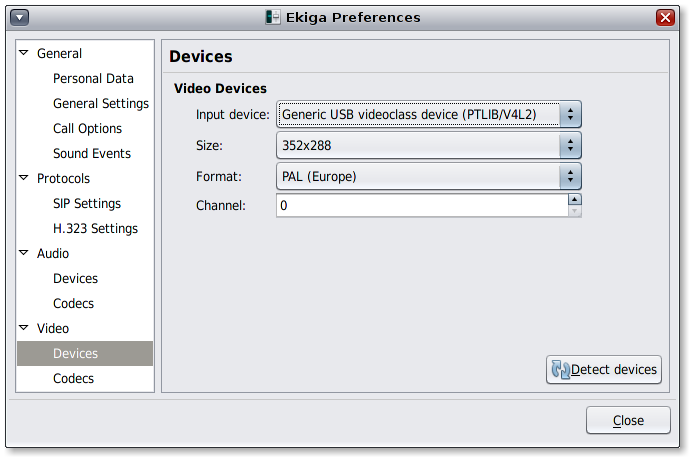 Ekiga 3.9.90 has initial support for H.239 (handling multiple video streams, such as video and presentation slides). This initial support is the following: Before the call, ekiga user can choose in Preferences->H.323 if he wants to see from the other party the main video stream or another video stream (presentation slides). In ekiga 4.0.0 except for Windows, the video stream to be shown can also be chosen during the communication, through the View menu. Ekiga 4.0.1 adds support for this on Windows too. In ekiga 4.1.0 the support is complete as receiver. This means that you can see both video streams simultaneously, in two windows. The extended stream window appears when a frame of the extended video is processed, and it is hidden when the communication ends. There is no support as sender for a second video stream. If you are behind a router, Ekiga has advanced NAT support thanks to STUN. In 95% of the cases, you do not have any configuration to do, and you can even be reachable from the outside without any port forwarding. In the other 5%, where Ekiga does not register, you have first to make sure the STUN ports are not blocked for outgoing connections to the STUN server. If they are not blocked, read the following. In SIP case, if during startup ekiga shows an error telling that it did not manage to configure your network settings automatically, then you need to reconfigure your router. You will have either to forward ports manually to your internal machine, or to dynamically navigate the router, as written in the next section (if it allows it, and a must do if you use Ekiga on several machines). Run Ekiga again, it should report "Cone NAT" or "Port Restricted NAT" and it will work. If it reports "Cone NAT" or "Port Restricted NAT" you probably need to forward a few other TCP ports, see below. If it reports "Symmetric NAT", then you will have to manually forward ports 5000 to 5100 to your internal machine. If you want to be reachable from the outside, you will need to forward TCP port 1720 from your router to the internal machine running Ekiga. If you want to be able to do calls with Netmeeting users, you will need to forward TCP ports 30000 to 30010 from the NAT router to the machine running Ekiga. This last step is only necessary when calling H.323 software that does not support H.245 Tunnelling (the H.323 part of Ekiga supports H.245 Tunnelling, forwarding that TCP port range is thus not required when calling them using H.323). You can apply individually the reasoning for SIP and for H.323. The UDP and TCP ports used by both protocols belong to the same ranges. IMPORTANT NOTE: Many VoIP forums report massive problems with some embedded SOHO routers blocking VoIP protocols restrictively and need the built in Firewall turned off (not that bad, You're still behind NAT and mostly protected). Netgear is known to have "very good hardened" firewalls. Ask Manufacturer Support and update Firmware first. For good sound quality a router with built in QoS is a must have, "V" type products should have it, older stuff rarer. The best routers to buy are Linux based and have GPL'ed Firmware. More information about symmetric NAT: Symmetric NAT means that it is not possible de guess what ports will be used. There is no solution in this case, except using an external proxy. Such proxies use VERY high bandwidths. (Skype for example avoids this problem by using users with public IP addresses themselves as proxies.) 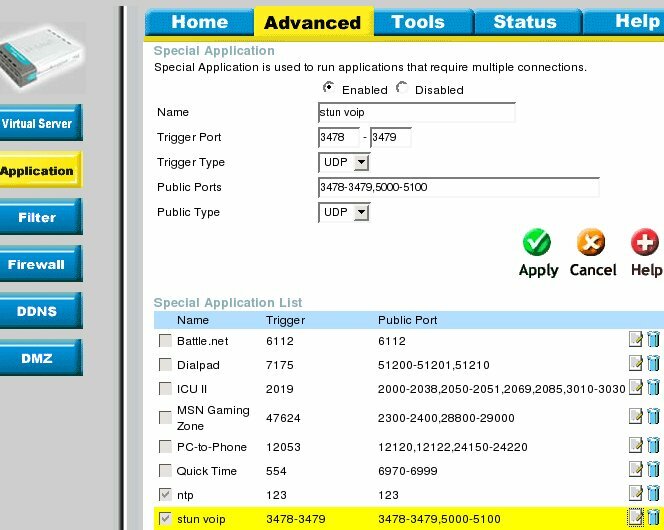 The default ports are defined by the standards SIP, H.323 and STUN. You should not change those ports exept for complex configurations or rare cases. To have Ekiga working properly with the default ports, you just have to run the configuration assistant using Edit → Configuration Assistant. It will show up automatically the first time you run Ekiga, just make sure to follow all its steps to the end. The "listen_port" value is the port Ekiga will listen for incoming connections on. It is different for SIP and H.323. The main port listening for incoming connections in Ekiga for SIP is port 5060 (UDP), while 1720 (TCP) is used by H.323. The "tcp_port_range" value is the range of TCP ports beside the listen_port that Ekiga will use for the H.245 channel with the H.323 protocol. That port range is not used by SIP. It is not used either when H.245 Tunneling is enabled, which is in general always the case, except when calling old H.323 implementations like Netmeeting. To change those ports, open gconf-editor, select apps from the left hand side menu and then select Ekiga. Then select "sip" or "h323", it should give you a list in the corresponding window to your right. Select listen_port and change it to your desired value. You can also change the UDP/RTP port ranges. Thanks to the Avahi implementation, Ekiga can use ZeroConf (the Bonjour / Rendez-Vous technology from Apple) for automatic Ekiga client discovery on the LAN. This port cannot be changed. Note: Ahavi/MDNS/STUN and friends might give you several drawbacks, like SSH clients taking a while to open, or requests to your apache from clients without reverse lookup getting 5 seconds penalty. Thus, if you are in a cooperate environment, and just want to talk to your local SIP-Gateway instead of doing this through your internet link, you should probably disable STUN (network detection) from Ekiga preferences dialog box. Removing mdns from your /etc/nsswitch.conf will resolve your ssh troubles. To understand the problems with symmetric NAT, read Understanding NAT/firewall issues with SIP clients (eg ekiga). This type of NAT cannot be served by a VoIP program without a "trick". Skype for example works in this case too because it uses the other users of skype as proxies, otherwise said the other users give (are forced to give) ressources (CPU and network bandwidth) for Symmetric NAT skipe users. Another solution is to have a public proxy for all the symmetric NAT users. This can work for audio traffic, but for (the much higher bandwidth consuming) video traffic this is overkill. And it seems iptel.org provides such a service, but for audio only. Finally, the simplest solution, if it works, is to change the NAT from Symmetric to another type. For that, if the Assistant Configuration reports a "symmetric NAT" (in ekiga v2) or you receive when ekiga starts a dialog box about that (in ekiga v3) and you have access to your router configuration, you may try the following. Typical SOHO routers incorporate a Network Address Translator (NAT): local network addresses are hidden behind (translated into) a single address presented to the WAN, which in the domestic case is normally that provided by an ISP. Normally incoming packets (those from the WAN) are silently dropped unless they match a previous outgoing packet. Apart from reasons of security, the router has no means of determining the destination address on the LAN if there is no match with a previous outward bound packet. This creates a problem in establishing a voip connection between machines which are both behind separate NATs: neither can reach the other to initiate communication even when a sip server has provided each with the other's address. Such routers normally have facilities for port forwarding: incoming packets for distinguished ports can be directed to a particular machine on the LAN behind the NAT. The limitation is that only the choosen machine can engage in voip calls. The STUN protocol (rfc 3489) is designed to solve this problem, but it does not work with symmetric NATs: those that are strict about incoming packets matching precisely a previous outgoing packet. Many NAT routers allow Application Rules to be defined which allow specified ports to be opened dynamically to incoming packets when triggered by an outgoing packet. If this trigger is fired when ekiga sends a packet to a STUN server, ports can be opened so that the STUN protocol sees essentially an open NAT: a full CONE. Actually, the trigger rules below just open a restricted range, so this is more accurately a "Port restricted NAT" which is how ekiga may describe the situation once the rules are in place. That then allows the voip traffic to pass unimpeded. It is only necessary to trigger on 3478, despite the previous example. For some unexplained reason, this firmware (1.52.15) does not offer a choice of protocols for Port Triggering. Troubleshooting is covered in more detail in the Troubleshooting Section in the wiki. These are the error message Ekiga presents. OPAL sends a numeric code to Ekiga and Ekiga presents these phrases to the user. The two messages with opal codes of n/a are produced internally by Ekiga. It has been noted that Ekiga cannot offer more details than it gets from OPAL. Defines specific terms in the book. You do not need to define terms that are in the http://www.bartleby.com/61/. Contain additional notes about related topics that are not directly explained in the document body. SIP URIs are formatted as such "sip:user@[host[:port]]"
H.323 URIs are formatted as such "h323:[user@][host[:port]]"
Callto URIs are formatted as such "callto:[user@][host[:port]]"
Callto URIs and H.323 URIs are formatted exactly the same except however callto URIs also support ILS lookups directly: callto:ils_server/user_mail. CANDIDATEFORSUPPRESSION_For example, calling callto:ils.seconix.com/joe.user@somedomain.com will look for the user with the joe.user@somedomain.com email address on the ILS server ils.seconix.com and proceed to initate a call. Some technical people might prefer OSS4 audio device over ALSA or Pulse. 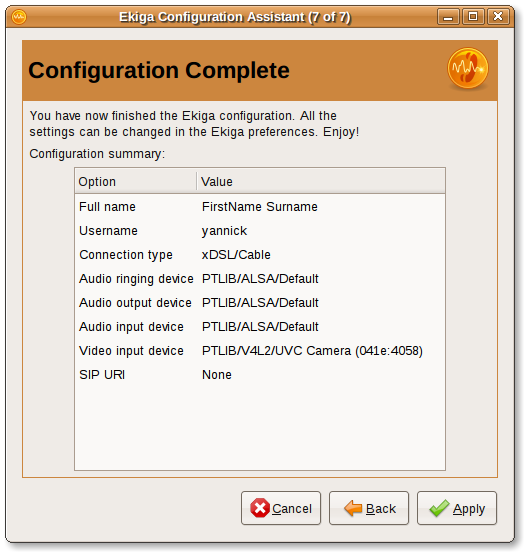 This appendix presents how to configure Ekiga to use it. To install OSS4, check your distro forums/documentation. Some distros such as Arch Linux provide packages in the main repository to install OSS 4.x. If your distro does not provide an OSS4 package, you may build OSS4 from source. You should most likely uninstall ALSA and Pulse Audio before installing OSS 4. 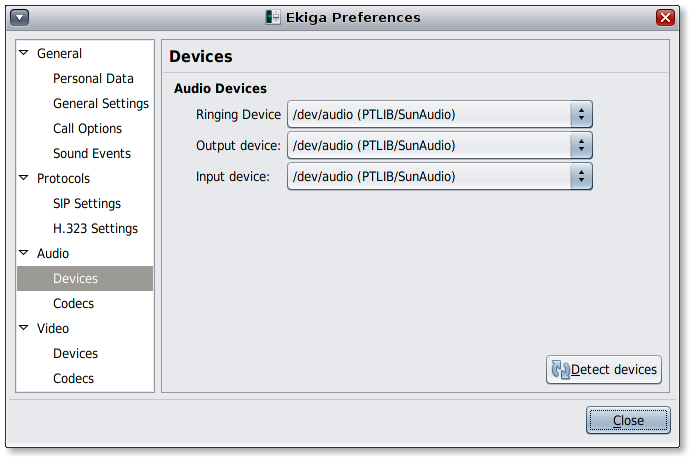 As of Ekiga 3.2.4 (PTLIB 2.6.2), OSS 4.x devices do not show up in the Ekiga Audio Device preferences. 1. Make sure that your installation of Ekiga includes OSS support. OSS support may not be enabled on your system by default. On Ubuntu 9.04, for example, you will need to install the libpt-plugins-oss package. 2. Close Ekiga and make sure no instances of Ekiga are running. 3. Manually set all audio devices in the Ekiga gconf options to "/dev/dsp (PTLIB/OSS)" where /dev/dsp is the OSS device you wish to use. $ gconftool-2 --set /apps/ekiga/devices/audio/input_device --type string "/dev/dsp (PTLIB/OSS)"
$ gconftool-2 --set /apps/ekiga/devices/audio/output_device --type string "/dev/dsp (PTLIB/OSS)"
$ gconftool-2 --set /apps/ekiga/general/sound_events/output_device --type string "/dev/dsp (PTLIB/OSS)"
Alternatively, you may edit the options with gconf-editor. 4. Start Ekiga and double-click "Echo Test" to make sure everything works. You will hear a woman voice and after, you should hear yourself talking with a small delay (echo). X-Lite 3.0/eyeBeam H.263 (1995) RFC 2190 QCIF 5-10 ~48k Preset "Cable"
CIF 5-15 ~256k Preset "Fast Cable"
CIF 15-25 ~512k Preset "LAN"
Provides keyword links to specific concepts in the book. Follow the guidelines in this guide to create an effective index.